Players who regularly changed teams during the hungry years of the Depression were referred to as “tram footballers” – and few were more deserving of the tag than Les Hughson, the 188cm, 90kg giant who was known to his mates as ‘Tiny’. In a career that was never less than colourful, Hughson played for five VFL/AFL clubs (still a joint record), stepping out with Hawthorn, Carlton, St Kilda and Fitzroy after his solitary game with Collingwood. Along the way he also managed to pull on a jumper with at least four other teams: the Telegraphists, Kew, Preston and Stawell. The man himself had one simple explanation for his wanderlust. While he held a job with the PMG as a linesman for almost 50 years, money was exceptionally tight in the late 1920s and 30s. So he had to use his football funds to survive. Hughson’s experience at Victoria Park was fleeting – just the one match in 1927 – but he did kick one of Collingwood’s 18 goals that day in a performance the Argus described as ‘promising’. He also earned the prize so many footballers crave – a Premiership medallion, something then handed out to everyone who played a senior game in a flag season. The following year he transferred to Hawthorn and the rest, as they say, is history. In all he totalled 73 VFL games, with 41 of them coming at St Kilda. His younger brothers Mick and Fred followed him to one of his five clubs, Fitzroy, where Fred became one of the Lions’ greatest-ever players, leading the team to its last flag, in 1944. A tough ruckman who was hard but fair, a driving kick and an excellent mark, Les Hughson Snr loved football, life and a cold beer. When appointed playing coach of Stawell in 1938, he was offered two pounds a week and “as much free beer as you can drink at the local pub”. 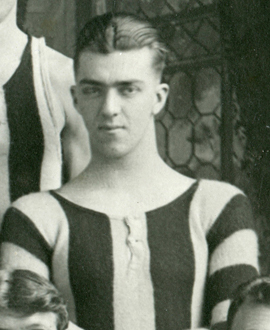 He led his team to the flag (over the favourites, the Jack Beveridge-coached Horsham), but the club was forced to change the arrangements the following year. They were happy to renegotiate the fee, but the pub was no longer willing to take a loss on the big-drinking, larger-than-life Hughson. He stayed on as coach and won the flag the next year, too. The Second World War interrupted Hughson’s country footballing exploits, and he served with the army in the Middle East. His own son, Les Jnr, had played alongside him at Stawell in 1940, then continued the family traditions by playing with Fitzroy between 1958 and 1962. Les Hughson may have been a “tram footballer” throughout his career, but few players enjoyed the ride as much as he did.